Here’s a tip that you may find useful that I just wrote for my other site, The Path Less Beaten. Earlier in the year I discovered that the usual place I’ve bought USGS topographic maps no longer carried a big selection. Only the immediate Carson City area is now covered, so I was out of luck for the places I was planning to go out of the area. I’m able to order them from Reno and get them in the mail the next day, but this isn’t always convenient. Especially if you need to browse first. Luckily a friend tipped me off to the USGS site where their topo maps are available for free download. Visit the USGS Store at http://store.usgs.gov/, and select the Map Locator & Downloader. Search or zoom into desired location. Click on the Mark Points button. Click on the area of the map you want, and this will stick a pin on it. Click on the pin to bring up a list of available maps for download. Printing your downloaded map on a single sheet of paper is almost useless. The words are too small to read, and the map is way too cluttered. Thankfully Adoboe Reader has a poster printing mode that expands the document into multiple sheets. Open the zip file, and bring up your downloaded map with Adobe Reader. Click on Print, and then select “Poster” under Page Size and Handling. Changing the Tile Scale to 92% gets the map down to 6 pages (100% is 9 pages) while keeping the map large and avoiding a lot of white space. This method has been very handy, and saves a lot of hassle. It’s now easy to get a map whenever I need one, even at the last minute. One thing to note though, is that you’ll want to protect your map from water. I once carried a page of my map in a pants pocket while it was raining, and discovered later that the ink had ran. Keep your map in a ziplock bag to keep it dry. 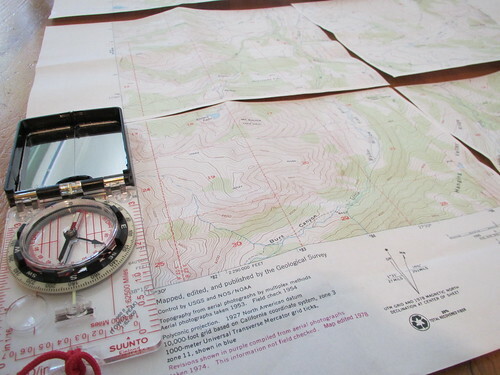 Free topo downloads. My local source has been drying up as well, so this is good to know. Thanks for the tip. National Geographic Adventure Paper ($24.95 for 25 8.5″x11″ sheets) or Map Seal ($11.95 for 8oz) will get you waterproof maps.as well.